'Take nothing but pictures, leave nothing but footprints' is a saying often used to highlight the concept of leaving no trace when we head into the hills and mountains. We all want to admire the pristine beauty of our countryside but this is sometimes marred by what is left behind by some walkers, sometimes through ignorance, sometimes through laziness. 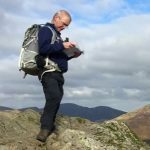 I want to use the blog to give some simple advise to help keep our countryside a pleasant place to visit. This entry was posted in Environmental on 12th April 2019 by Life Changing Challenges. Scree running is fun, particularly after the arduous climb the night before. The guides, Kertrina and I stood at Stellar Point looking down the way we had come up – in the light it was completely different. The sun was up now and starting to burn, Kertrina was still suffering with the altitude and the guides had quite rightly determined that down to Barafu Camp was the safest and most expedient way of fixing this little issue. Coming up had taken 7 hours, going back down to 4,600m from 5,745m should take 3. 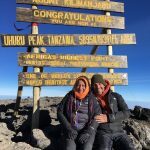 This entry was posted in Challengers, Kilimanjaro on 2nd April 2019 by Life Changing Challenges.